Starting a new piece is always exciting, but you can’t get your hands in the paint, until all the compositional details are worked out. 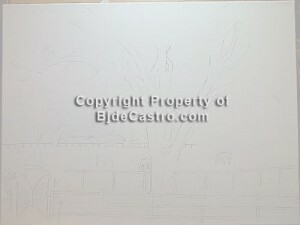 This landscape was more of a portait of a property than anything else, so I had to be true to the elements in the piece. 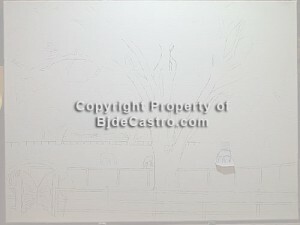 But I did take artist license with illimination of many items on the property that were not vital to Ranchita’s identity and that would ‘clutter’ my composition. 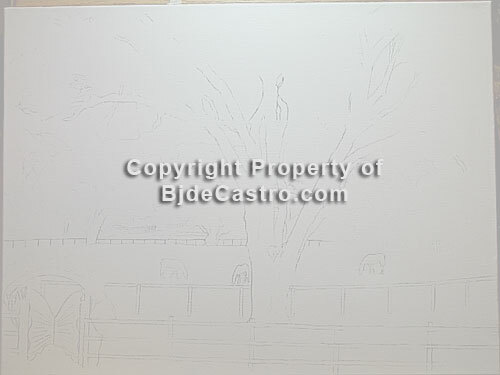 I also struggled a bit as to whether or not I wanted the 3rd horse…and where it should be placed. So as I often do, I made a thumbnail clipping and moved it around the canvas stuck with tape. In these initial planning stages, I am building a map that I want you to use as your eyes travel around the painting. If you have a poor map, then your viewer’s eyes are going to go left to right, by nature, and then be finished. To keep their eyes traveling in circles around each piece with gentle stops on my points of interest, I use composition, value changes and lighting. 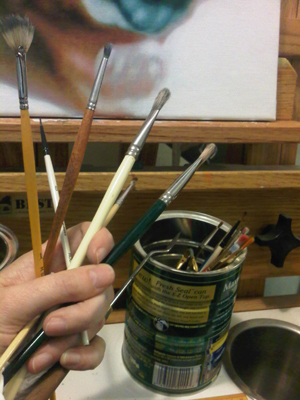 I double-check it in my mirror to fool my own eye and then when I am happy…it’s time to get the brushes out.